Size: 1&5/8" Long X 1" Wide. Most Are Made of Aluminum. Each Cross Comes with 2" X 3 & 3/4" Card. Customer must put Cross & Card in Bags!! Select from the drop-down box!!! 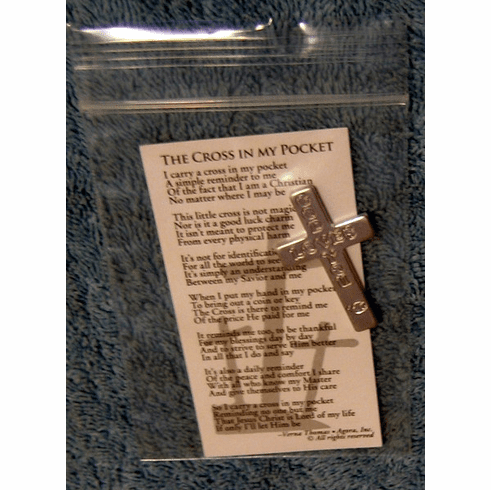 Cross in My Pocket is a powerful reminder that Christ is everywhere and will help protects you from the evils of this world. This pack of 10 would make an excellent Conformation, communion gift. It is sure to lighten the heart of any person it is given to. Great as witness tool! Our inspirational Pocket Reminders have given many people the opportunity to share their faith with others. Individuals, religious leaders, and laypersons of all denominations have used these for: Personal witnessing, Church members as a personal reminder of their faith, Visitors attending church, Pastoral calls and hospital visitation, Evangelism in the communities, Vacation Bible School, Calling Cards, Emmaus, Tres Dias, and other weekend retreats, Weddings, funerals, and family reunions. I carry a cross in my pocket A simple reminder to me Of the fact that I am a Christian No matter where I may be. This little cross is not magic Nor is it a good luck charm. It isn't meant to protect me. From every physical harm. It's not for identification For all the world to see. It's simply an understanding Between my Savior and me. When I put my hand in my pocket To bring out a coin or key. The cross is there to remind me Of the price he paid for me. It reminds me, too, to be thankful For my blessings day by day And strive to serve him better In all that I do and say. It's also a daily reminder Of the peace and comfort I share With all who know my master And give themselves to his care. So, I carry a cross in my pocket Reminding no one but me That Jesus Christ is Lord of my life If only I'll let him be. Get your Cross in My Pocket at discount prices. Christian Discount Shop offers the best in Christian gifts at the lowest prices.